POWR2, a North American leader in innovative energy solutions, launches the latest energy technology, Hybrid Energy Systems (HES). This sustainable equipment will help power rental companies expand their markets, cut maintenance and fuel costs, improve efficiency, and reduce emissions. In addition, the technology will help extend generator life and increase resale value. The POWR2 HES is a portable power supply that integrates with diesel generators to optimize load capacities. The power supply features leading lithium ion battery technology and automatic load level sensing, allowing it to switch power flow as needed between the generator and the HES. This includes using the generator for higher loads and stored energy for lower loads. The HES also enables the storage and use of alternative energy sources when paired with electricity-producing systems such as solar, wind, and hydroelectricity. In addition, it is silent, as opposed to diesel generators, making it ideal for noise-sensitive jobsites, events, or applications. “The HES offers power rental companies a variety of benefits, from cleaner operations and reduced maintenance to lower noise levels and increased versatility of the product,” Nunn says. While Tier IV regulations were aimed at reducing emissions, few companies understand that those regulations only limit NOx and PM10 particles, completely failing to address CO2 emissions. POWR2’s HES limits the necessary run time of the diesel generator, reducing CO2 emissions by up to 80 percent. By proactively reducing CO2 emissions, this technology addresses what Tier IV regulations do not and puts users ahead of future regulatory actions. Compounding the emissions problem and further adding in a maintenance issue is the challenge of wet stacking. Generators are often over specified, spending most of their service life running on low loads. This inefficiency can lead to wet stacking, a condition in which unburnt fuel passes into the exhaust system. Wet stacking has always been an issue with diesel generators, but it’s especially damaging to Tier IV units, causing significant and sometimes permanent damage. The use of HES to manage low loads virtually eliminates the risk of wet stacking and can cut associated generator maintenance time and costs in half. While load banks installed on generators address the problem of wet stacking, they increase CO2 emissions and fuel costs. If set to provide power half of the time, HES can boost a generator’s life significantly. The reduced generator use also lowers fuel costs by as much as 80 percent. In addition to eliminating the issues associated with running a generator on low load, the HES technology also allows users to rent a smaller generator by providing temporary extra power for load spikes—for example, the surge in demand when a motor starts up. POWR2 HES inverters can handle load spikes double their specified capacity. 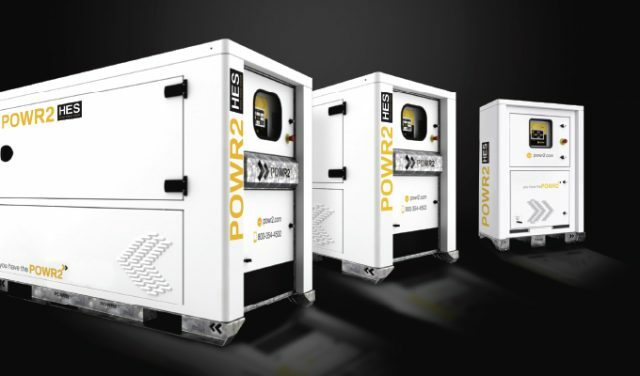 POWR2 offers six HES models with outputs from 3.7kVA to 60kVA. Storage ranges from 7.5kWh to 120kWh. All models feature POWR2’s Node ECM (Energy Control Module) 7-inch touch screen. Node retrieves data from all connected devices including inverters, batteries, diesel gensets, PV, and more. The system displays the information on the screen and uses it to inform which energy source to use and which loads to prioritize. POWR2 also offers its Prism EMS (Energy Management System) software for reporting and business intelligence, remote asset management, and customer billing. The HES range features remote generator start and remote communication, including GPS location tracking. All models include forklift pockets, lift, and drag skid lift points. POWR2 also includes temperature control features on all models. HES units are maintenance free, featuring a 3-year warranty. POWR2 is the industry’s leader in rental ready hybrid energy systems in the U.S. The company is dedicated to empowering its customers with innovative power generation solutions that enable them to cut costs, improve efficiency, extend asset life, and better care for the environment. With years of experience in the power generation industry, POWR2 effectively provides customers with solutions to their problems. For more information, visit www.powr2.com.